Designed to meet the standards of the U.S. Army Individual Carbine Program, the M6A2 Individual Carbine is the next evolution of the AR platform. The Individual Carbine features fully ambidextrous controls including bolt catch and release, charging handle, magazine release, and safety for complete manipulation for right or left hand shooters. 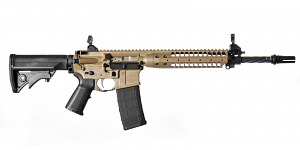 Additionally, the Individual Carbine features LWRCI's patented Monoforged upper receiver which features a mounting base for the handguard that is machined as part of the upper receiver for added strength and reduced weight. The two position short stroke gas piston system enhances reliability over extended periods of use. Comes with Magpul pistol grip, flip up skirmish sights, and one 30RD PMAG.